How does a lifelong Russophobe get appointed to the most powerful House chairmanship except by purposeful and cynical design. “You talk about compromised and easily coerced. unless they have been bribed or blackmailed to. 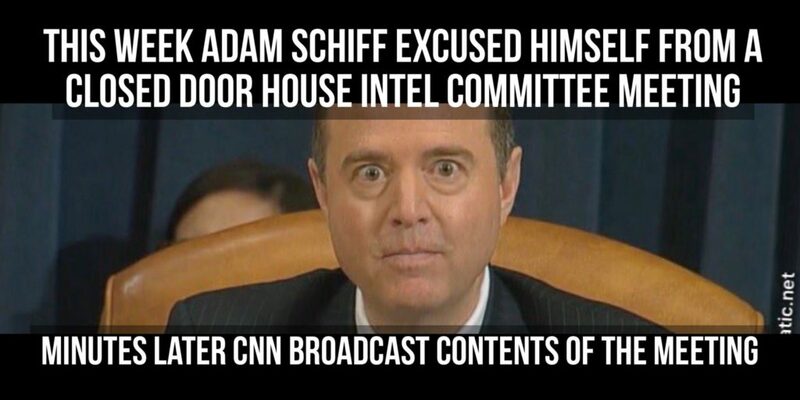 SOTN Editor’s Note: What follows is an exposé titled “The Most Dangerous Politician In America” on Rep. Adam Schiff, the current Chair of the House Intelligence Committee. 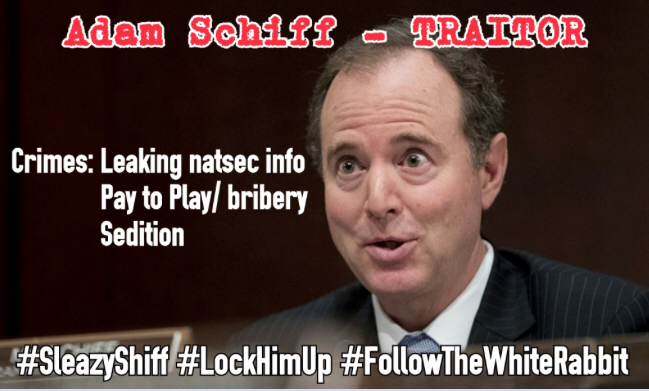 This highly radioactive back story has been published exclusively by SOTN and is considered only the tip of the iceberg regarding Schiff’s unbridled treachery and seditious MO. But first, here’s another inconvenient development for Grand Inquisitor Schiff. Why did Adam Schiff have a secret meeting with Glenn Simpson, the Fusion GPS founder who lied to Congress? There is perhaps no other member of Congress who is so dangerous to the American Republic operating in his current leadership capacity within the Democrat House leadership. That he got appointed in the first place, particularly in view of his illegal leaking and naked perfidy, reflects the profoundly malevolent powers that truly control him. Schiff has repeatedly proven himself determined to overthrow the Trump administration by any means possible. He has also demonstrated his willingness to help start World War III with Russia as he carries out the orders of his Neocon masters. N.B. Now here’s the exposé which demands wide circulation in light of the extreme dangers that Adam Schiff represents to the United States of America. • Secondly, Schiff was chosen as the point man to lead the witch hunt against Russia. In the process of using his high perch as the Grand Inquisitor, he is an ever-present spokesman for the bogus Russian hacking conspiracy. He knows the truth of the matter, yet he still uses the largest corporate media platforms to incessantly repeat his false claims about Putin’s Kremlin. All of this transparent warmongering has the explicit purpose of instigating a war with the Russian Federation. Countries throughout the European Union have become an echo-chamber, parroting Schiff’s accusations whenever there’s an upcoming election. Apparently, Miller was an unofficially unacknowledged double agent (by his own admission) who was used by his FBI superiors in a botched counterespionage operation. In spite of the classified facts of the case, Schiff willingly went after Miller to cover for the FBI’s own ineptitude. In other words, because of Miller’s lack of competence and experience to carry out his assignment (he literally threw himself at a female Russian access agent), the FBI got caught with its pants down. The prosecution of Miller, then, became the only face-saving measure for the FBI. Sound familiar? KEY POINTS: As Schiff sits on the House Permanent Select Committee on Intelligence, he issues many baseless assertions and ridiculous speculations about the contrived Russiagate which have been ricocheting around the world for months now. He knows that he’s being used to start a shootin’ match with Putin’s Russia but shamelessly advances one false allegation after another. As more information comes out — that there really is no evidence of a conspiracy — and that Russia did not hack the 2016 election, Schiff doubles down on any tenuous thread he can pull on to somehow reinvigorate his fraudulent prosecution of Trump and Russia. Joseph McCarthy, himself, would be mortified at how much traction the fictitious narrative spun by Schiff has gained. And virtually everyone knows it, especially the fake news producers throughout the MSM. Sen. Joseph McCarthy was entirely correct that the US government and American high society were infested with communists. As a matter of fact, the United States is now reeling from that same communist conspiracy to destroy the Republic. However, the senator’s hardnosed tactics of leveling accusations without sufficient evidence were taken advantage of by those who were successful in torpedoing the notorious McCarthy hearings during the first half of the 1950s. Because the mainstream media was so full of communists at that time (as they are now), the major MSM organs of propaganda launched a coordinated attack on the whole Red Scare initiative. The highly unfortunate outcome is what has permitted unscrupulous politicians like Adam Schiff to thrive in California’s communist sanctuary. After all, they took over Hollywood first along wth the rest of the corporate media. 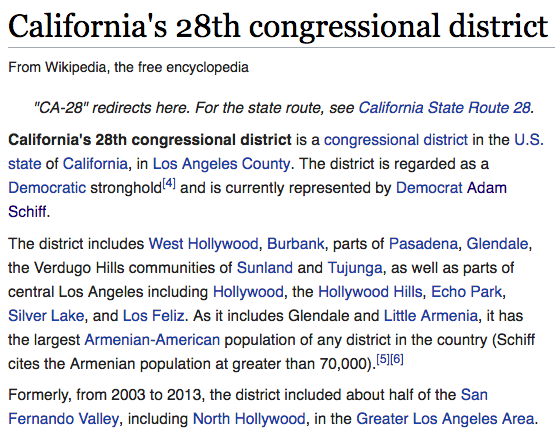 Schiff’s 28th congressional district includes Hollywood, Hollywood Hills, West Hollywood, Burbank, Pasadena and the rest of the Pedogate paradise (see screenshot below).